Ninjas are cool. With lightning-quick reflexes, deadly accuracy and the ability to disappear at will, it’s no wonder ninjas are the focal point for many popular gaming franchises. The mystique and awe that surrounds the idea of a ninja bleeds easily into interesting game mechanics. Shadow Blade: Reload for the PC takes the idea of quick reflexes and deadly accuracy as the main points to look at with regards to ninjas. While it does so in an interesting way, the clichéd story and straightforward gameplay do little for the game overall. In Shadow Blade: Reload you play as Kuro, a young ninja who wants to become the ‘Shadow Blade’, a powerful and legendary title. He seeks out a ninja master to teach him how to become this legendary ninja and, as luck would have it, this is the last ninja master around. To make matters worse, it seems like all sorts of villainous characters have taken up residence in what could only be described as one of the least secure master-ninja dojos on Earth, no wonder these other masters are gone. Players will have to be quick and accurate to get rid of their foes, all the while moving forward to reach the end of the level. 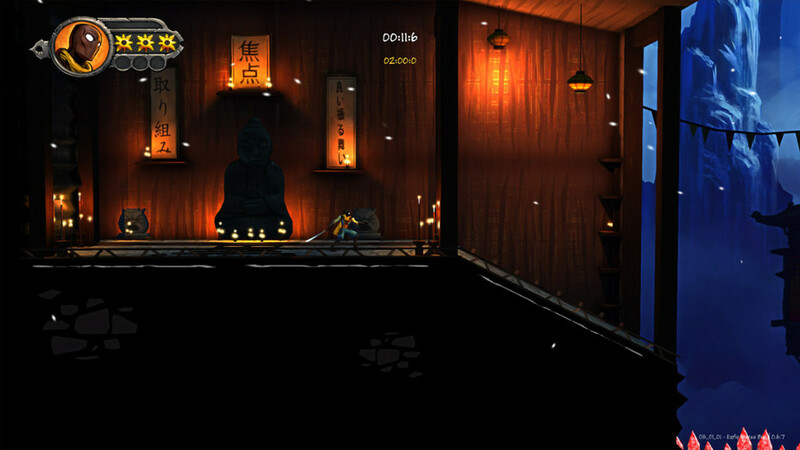 There are two main gameplay elements in Shadow Blade: Reload, combat and platforming. While most platformers separate the two into specific chunks, Shadow Blade: Reload is all about speed, speed, speed. Levels are timed so if you’re a perfectionist or a competitive player, you’ll want to get the best time possible on any given level. That means combining combat and platforming to make the most, or least, out of your runs. Jumping from one platform to the next and slicing an enemy’s head off has a great feel to it, the first few times. Animations get stale after a while and for those of us that don’t care about our times, there are a few select maneuvers that take care of enemies of almost any type. Shadow Blade: Reload does do a great job of throwing different enemy types at you throughout the game. Enemies vary from melee-focused to ranged and even then there are different types of each. The homing-missile enemies are particularly infuriating but they do a great job of increasing the tension when nothing else is going on. At times there is a hellish-platformer feel to the game in which the player dies over and over again, just moments before figuring out the solution. For the most part though, these moments are few and far between and act as a reminder of what the game could’ve been and not what it is. The same goes for the game’s boss fights. These interesting fights show of the game’s creativity and ingenuity when it comes to mechanics, but they again are too few to be anything other than a brief spark of life in an otherwise standard experience. A lot of the platforming and combat feels repetitive after the first world and I found myself relying on the same handful of moves to get by. Sure, players who want to get the best time will find a sickening selection of interesting moves to pull out of their hat with perfect timing, but for the average gamer the experience falls a bit flat. Don’t get me wrong, I enjoyed my time hopping from platform to platform, I just wish there was more to do than take in the beautiful scenery amidst countless beheadings. And beautiful this game is. With a unique art style that paints the ninja-world in a colorful light, rather than a dim and bleak one as is typical, Shadow Blade: Reload is a real joy to look at. Cut scenes are told in a comic-esque fashion with bright, gorgeous art and a sleek look. The motion added to these cut scenes do a great job of making them feel alive and watching the story play out in that shaded world is always fun. Of course, it would be more enjoyable if the story wasn’t one filled with clichés. Shadow Blade: Reload, like many ninja-focused games, suffers from the heavy overuse of clichés and tropes that make the story feel generic and boring far too quickly. After just the second cut scene I felt disinterested and ready to write off the story, and it never really got back on track from there. It’s worth noting that one of the big features of the “Reload” version is the level editor that allows you to create and share levels. While the level editor felt easy to get a grip on and I put together a few interesting levels, I didn’t get that much enjoyment from the editor overall. That being said, I’m interested to see what kind of hellish levels fans of this game can come up with as there are sure to be levels that test both your skill and sanity. While the story and overall gameplay are the very definition of standard, there is still something to like about Shadow Blade: Reload. Players who want to complete the level and do so in the shortest amount of time will find a lot to love in this game and even more so in the game’s replay value. However, when the initial awe wears off, Shadow Blade: Reload comes across as a generic ninja-action game with an interesting art style, good controls and an otherwise underwhelming story. I had a lot of fun learning the ins and outs of each character and weapon and, like a good fighting game, I found the character I’m going to stick with. I played many hours of Nuclear Throne and I expect it to be the game I come back to the most in 2016. Nuclear Throne knows what it is and makes no bones about it. It’s a difficult, stylized roguelike with a clear vision of what it’s trying to achieve. Everything from the unique art style to the tough-as-nails gameplay makes it a rollercoaster of emotions whether you’re playing it for 15 minutes or 15 hours. Mushroom 11 does a great job of realizing a concept and sticking to it, it’s just too bad that concept falters as much as it does, making the game feel like a big miss instead of an indie darling. I didn’t enjoy Grimind and that’s a shame. There was a promising idea here but nothing in the game came together to make for an interesting experience. Instead, I was left frustrated and underwhelmed as I tediously hopped from platform to platform, wondering if I’d live to see the next checkpoint or die trying, and shaking my head as the latter became true.